we would like to announce that TVXQ! Express is holding a giveaway! 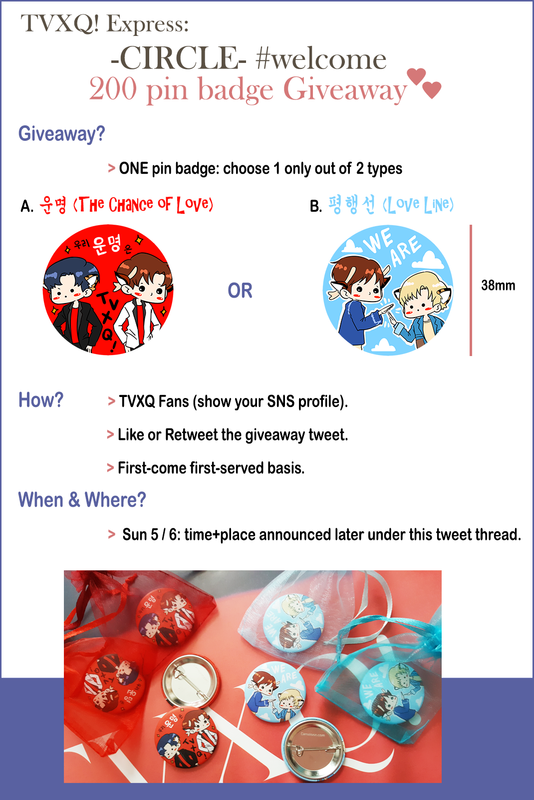 200 pin badges, designed after TVXQ’s 8th album, will be gifted to TVXQ fans who are attending ‘TVXQ! CONCERT -CIRCLE- #welcome’ this weekend in Seoul! Details can be found at the giveaway page: here. TVXQ! 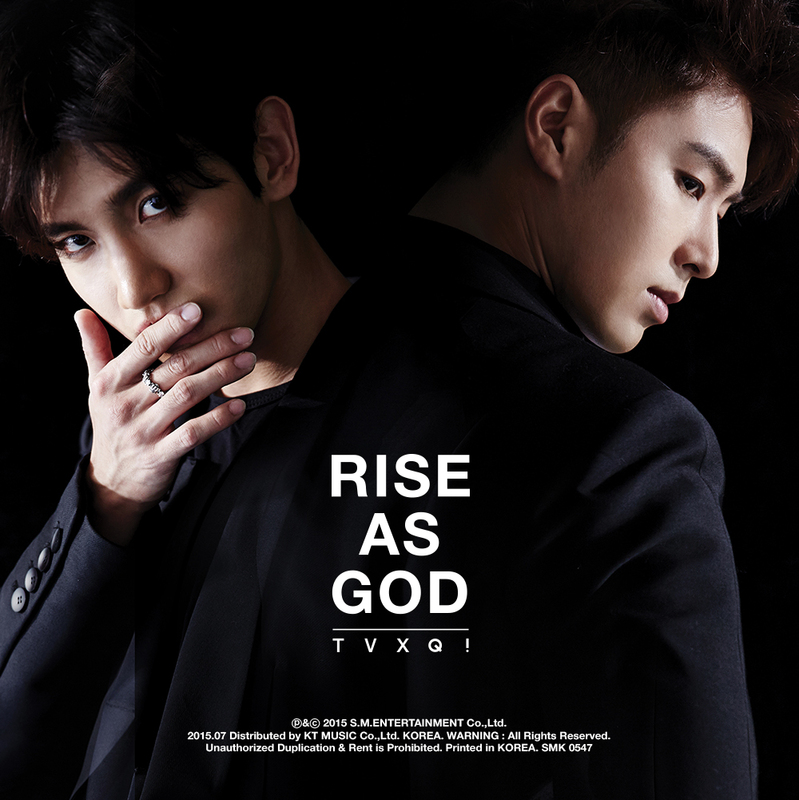 Express’s giveaway contest Reboot “Begin Again with TVXQ!” (Twitter Only) has started yesterday! As you can see, it is for twitter users only to celebrate @TVXQ‘s new account there! We are giving away four singles this time! So if you have a twitter account, in which you have posted as a fan for at least one year, please go ahead and participate! This is running for only 10 days, so the deadline is 12/22 at 23:59 (JST). Check out the project post for more details. Due to some recent misunderstandings, TVXQ! Express would like to inform their followers and whom it may concerns that, in any future events, if someone personally approached you using our name for whatever reason, then there must be a follow up confirmation message from one of TVXQ Express’s official SNS accounts (Twitter: @TVXQExpress, Tumblr: TVXQExpress, Facebook: TVXQExpress, Youtube Channel: TVXQ Express) or our email TVXQExpress@gmail.com. If none of our official accounts contacted you in a maximum of 3 days, then please understand that TVXQ Express is not aware of these actions, whether they were from people who identified themselves as our members or not. Come on join us in our Birthday project for Yunho and Changmin for this year~♥ o(*^▽^*)o ! It came to our attention that some of our own materials are being used against our sharing rules. We are not asking for much, our rules are simple and basic. We think that five years are more than enough to acknowledge Yunho’s and Changmin’s +11 years of non-stopping hard work for TVXQ/東方神起, and it is our duty as their fans to inform both other fans and non-fans about them, not to confuse them. Please respect that, address the duo the way they address themselves, acknowledge their words and beliefs until now, and show your support to TVXQ/東方神起 by both your actions and words, or please just stop using us as a bridge to nurture your own ideals about them. Hello dear TVXQ! Express readers! we would like to announce that we have finally updated the website with TVXQ! Express Rules! hooray ＼( °▽°)/!! here’s the page! You could also reach it through the main menu above! 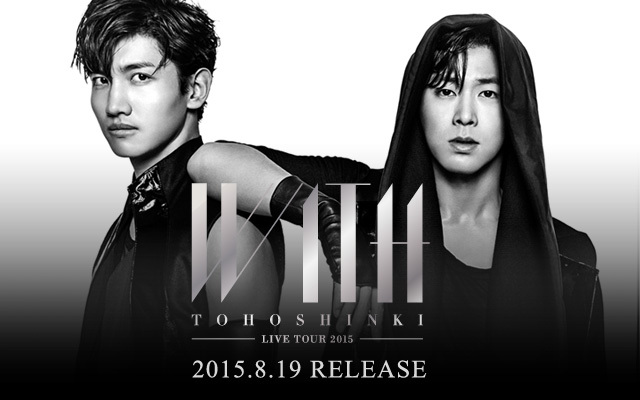 [NOTICE] Giveaway Contest SAKURAMICHI “With TVXQ!”: WINNERS Announced! First of all, we would like to thank all the participants in this giveaway contest for sharing their precious emotions for TVXQ! with us! it brought us so much joy reading all these lovely submissions and we were able to relate to many of them! It’s unfortunate that we only have 10 CDs to giveaway, and we had some hard time picking the winning pieces! The winning pieces have been chosen through both group voting (your not straying away from main objective of the giveaway was a main determinant) and doing a lucky draw for when there was a tie. Tagged Giveaway Contest: SAKURAMICHI “With TVXQ!”, JP Single: SAKURAMICHI, Tohoshinki, TVXQ! [NOTICE] Giveaway Contest SAKURAMICHI “With TVXQ!” has Closed! TVXQ! Express’s giveaway contest SAKURAMICHI “With TVXQ!” has ended! If anyone has sent us an email with an Entry but received no reply from us yet please notify us! [TVXQ! Express Post] Happy New Year!! May 2015 Be full of Blessings and Achievements! On behalf of the TVXQ! Express team, I would like to wish everyone a happy new year! May you all and your loved ones be blessed with happiness and good health!